Just 24 hours after losing a heartbreaker to the Edmonton Oilers, le Club de hockey Canadien (otherwise known as the Montreal Canadiens) visit the friendly confines of the Scotiabank Saddledome for a match-up with the Calgary Flames. The Canadiens are really, really good, but historically the Flames have risen up to meet their old rival. Maybe it’s because they’ve met in two Stanley Cup Finals three decades ago, and maybe it’s because deep down the Flames have always been a staunchly proud bunch, but because this game has the potential for embarrassment, that’s the reason I think the home side comes out swinging. For the curious: the Flames are 2-7-1, the Habs are 9-2-0, and you can catch all the action tonight on Sportsnet Flames and Sportsnet 960 The Fan. The locals swapped some bodies around yesterday, sending Jakub Nakladal down to the AHL’s Stockton Heat and bringing back Karri Ramo from his one-game AHL exile. Your netminder tonight is Joni Ortio (0-1-1, 2.98 goals against average, .911 save percentage), who played in relief of Jonas Hiller on Wednesday and helped capture the loser point for the Flames. He’ll be backed up by Karri Ramo. At morning skate, the extra bodies appeared to be Ladislav Smid and Brandon Bollig, which would be great if that’s the case. Lance Bouma and Micheal Ferland are on the injured reserve, and Jonas Hiller is out at least a week with a lower-body injury, but is not yet on the injured reserve. The Flames will be playing a team that played last night. The key to victory? Tiring them out. If the Flames emphasize their speed and make the Habs run around their own end and hem them in constantly, this becomes a winnable game. But if they continually give up possession of the puck to the Habs – who are very good at ice hockey – will do their best to hold onto it and slaughter the Flames. Calgary’s special teams continue to be a concern. Their power-play scored a goal in the third in Ottawa – after that bizarre Bobby Ryan/Jonas Hiller collision – but otherwise struggled. They need to generate more chances with the extra man and do their absolute best to keep their penalty kill off the ice (and minimize the bleeding when they do have to hit the ice). The return of T.J. Brodie has helped somewhat in both respects, and will hopefully continue to as he gets back into the swing of things. The crowd may be a factor, too. Montreal is one of the more popular Original Six visitors whenever they come to town, and it’s likely that the crowd could get loud and hostile towards the home side should they get down a goal or two early. If the Flames can stay with it, they can either negate the crowd or get them on their side. Keep An Eye On: Johnny Gaudreau has been Calgary’s best player for the entire season thus far. Despite being keyed-in on by most other teams, he’s put up 11 points in 10 games, and he remains Calgary’s most dangerous player. 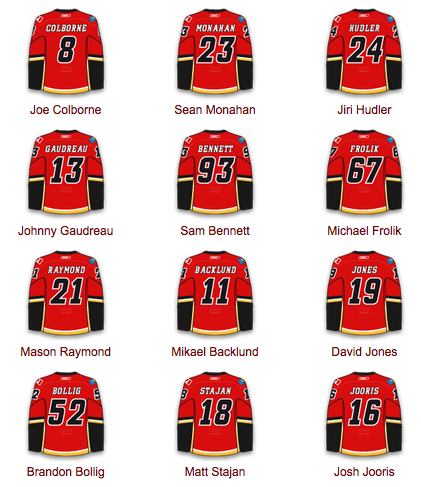 Now that he’s on a line with Sam Bennett, perhaps they can start racking up some points together. 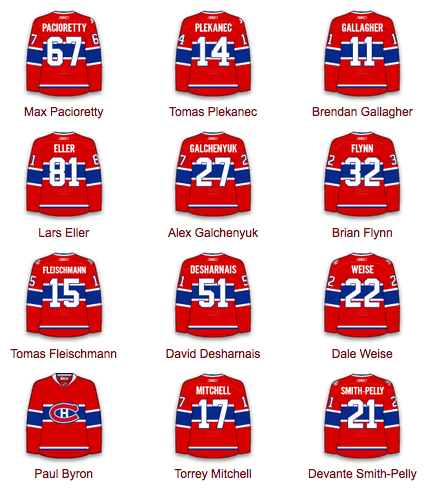 Back-up Mike Condon gets the start for Montreal after Carey Price played last night in Edmonton. Condon’s been excellent in his two starts, going 2-0-0 with a 1.50 goals against average and .949 save percentage. Both aren’t sustainable, but both are pretty terrifying for the opposition. The Habs went up early last night and threw it into cruise control, which allowed the Oilers to find a rhythm and get things rolling. So expect a tired and frustrated Habs team, but one that’ll likely be committed to playing a more consistent game and not letting it slip away from them as the game wears on. Keep An Eye On: Let’s go with P.K. Subban, who’s just phenomenal. He’s one of four Canadiens players that are scoring a point-per-game pace. The other three? 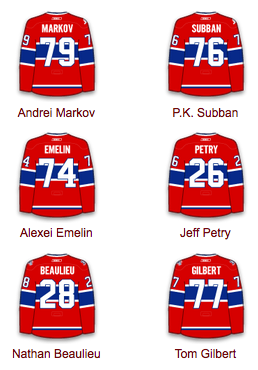 Andrei Markov, Tomas Plekanec and new captain Max Pacioretty. The Flames earned three of a possible four points in their two meetings with the Canadiens last season, and both games were really entertaining, to boot. The Flames lost 2-1 in a shootout on October 28 of last year, then headed to Montreal and put up a 6-2 victory five days later. 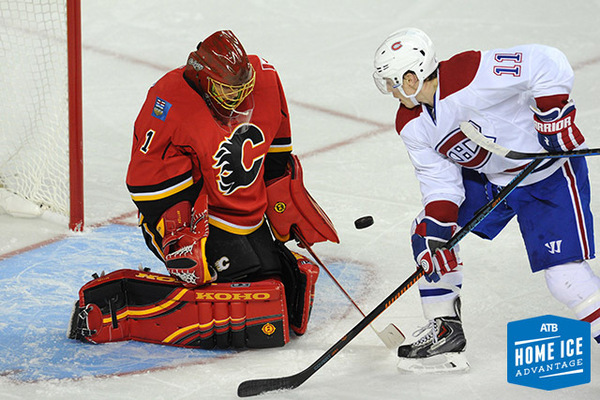 In 109 previous regular season meetings, the Flames have a 37-55-15-2 record against Montreal. They split a pair of meetings in the Stanley Cup Finals in 1986 and 1989. The Stockton Heat are heading to southern California to visit the San Diego Gulls. In college, Boston University (Brandon Hickey) faces Merrimack and Providence College (Mark Jankowski and John Gilmour) faces Colgate. In junior, North Bay (Riley Bruce) visits Kitchener. The Flames are playing the first game of a back-to-back. They have five points through their first 10 games. They need a big win, if only to keep hope alive in the locker room. They face a Canadiens club that played (and lost) last night, and get the back-up netminder rather than the reigning Hart Trophy winner. This is as much help as the hockey gods might give ever them. Flames had the better puck control game tonight. This may come as a surprise, but their sh% and sv% conspired to sink them. Is this oiler nation or flames nation? Some days it’ hard to tell. It’s over boys. See you next year. I wish we could skip the game tomorrow. We need three goalies again!!!! After a 6-2 slap down from MTL. 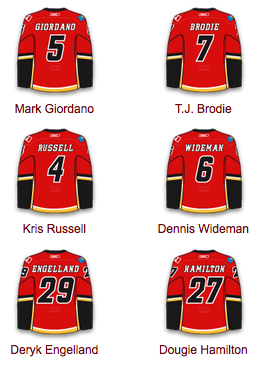 We could have kept each goalie in for 2 then pull’em after the 6th and let Wideman and Russel play net after that. Maybe the D-men can try getting the puck out or heck playing D??? Where’s the secondary scoring, the best defence in the league??? Not seeing it. Oilers …. just shoot the puck on net. Oil 5-1 Sat. I think there are canuck colors on my wagon … damn! Ari is the new Supreme Empress of the Nations. Typically the draft stuff becomes available as soon as the season begins, but there’s really not much to go on outside of “this kid looked really good in his 16 year-old season” and some WJs stuff. Your kidding right? You mean no one has established at this point a list of top players and projected draft status? I’m guessing I can google it and quickly find all kinds of stuff…I know Oilernation is much more experienced at this perhaps I should post my question there…. No, there are lots of lists available, but it is very early. Back in 2011 the top five included Yakupov and Frk. By the time the draft rolled around Frk fell to the 2nd round. Links to every player’s stats. Brutal site because of flash ads, but the data is tremendous. Ortio was as bad as Hiller tonight!!! Dear god Ramo please give us even marginal goaltending tomorrow. I would be ecstatic with less than 4 goals against and a 900 SV% at this point. Another good effort half way though the game wasted by poor goals that absolutely deflated the team that they couldn’t catchup from. Best prospects this year are Matthews, Chychrun and Puljujarvi. A center, a defender and a winger. Doesn’t sound like there’s necessarily a generational talent there, but the top prospect is, as usual, a tremendous player and the rest looks like a strong group of varied prospects. Auston Mathews USHL numbers are a hair better than Jack Echel’s were at the same age…. One could also argue Mathews NCAA numbers (USNDTP only play exhibition games) were even better than Echel’s last year as well a year younger. Depends what you think is a generational player, but I know people who watched both Mathews last year in NCAA and Echel and they all say Mathews was better. I’m coming from the perspective of someone who has watched a lot of draft hype over the past ten five to ten years. Media scouts use hyperoble as a common currency. Let’s see where he is in January. Not saying he couldn’t be as good or better than Eichel, but we need more time. Did someone neuder our mods. No Mojo. Who on this team can you honestly say with exception of one player, will take this team the next level. Right now collectively every player on this team is getting their lunchbox handed to them in one on one battles. The reason the Flames are where they are is they cannot compete against player across from them. Goaltending is a moot point. Terrible is putting it politely. Unfortunately for Treliving, Hartley and company and us fans we have to realize that we don’t have a chance at making the playoffs this year unless there is major shake up to the roster. While only 11 games into the season, after tonight’s beat down provides me with little confidence that this team can turn this season around. The team has lost any confidence and ability to fight through tough stretches inside each game. There is no “chip” or desire to outcompete their opponents. 1-5 on home ice, just not good enough. as a die hard flames fan, it pains me to say it (but i do like the oilers also…..I like alberta teams), but Mcdavid is special. Im not an idiot anybody doing what he is doing is a great player. anybody doing what he is doing at 18 is beyond generational!! Sorry Shaner. Not jealous. And, not saying Connor isn’t very good. Just saying to not discredit Austin just because he hasn’t had the same hype. He’s really good. Oilers, Flyers, Avs, Devils, Panthers, Ducks and Coyotes are all games the Flames have at last a chance at winning. That’s seven out of twelve that could go either way with the rest being longshots. By the time they get to the Caps (Nov 13th) we should know if the season is lost or can be salvaged. If you can’t see the writing on the wall – you probably aren’t looking at the right wall.